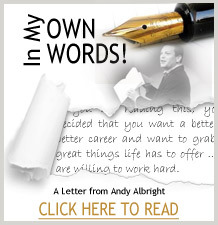 Hello, I’m Andy Albright and I want to help YOU. If you are reading this, you have decided that you want a better life, a better career and want to grab all the great things life has to offer … if you are willing to work hard. My goal is to add more value to your world than you ever imagined possible by arming you with the tools that you can use NOW – not later – to reach your goals in business and life. I want to make you rich! It’s not all about fancy toys and piles of cash is it? No, but those things come when you unlock your full potential, work hard and help others get what they want in life. When you share your gifts with the world, you will be rewarded and you might even make this crazy world a better place too. If you are looking for Donald Trump, Warren Buffett or Bill Gates, I’m not your guy. I am a hard worker, an entrepreneur and a person that has seen first-hand what doing the little things to get to where you want to go can do for your life. I was born in Burlington, N.C., went to North Carolina State University and got an engineering degree, which led to me working in the textiles industry before NAFTA shook the entire industry in the United States. Even when that happened, I kept dreamin ... big! I've built an Insurance Marketing Organization that is nationwide, written two books and now I’m sharing my Albright Challenge with you and anybody else that has a dream to be successful. I love getting people "to move" and I encourage them to figure out where they are and where they want to go. I do it daily and there’s not a better feeling than seeing the light bulb go off in somebody’s head that finally gets it. I’ve spent most of the last 20 years learning from some of the best trainers you can name … people like John C. Maxwell, Tony Robbins and Brian Tracy, just to name a few. What I've learned is that you must bring 100 percent to what you want or it’s not likely going to happen for you. You have to take an "All In" attitude to reach your dreams and goals. I love people and I want to see them be the best they possibly can be. There is nothing worse than wasted potential. It’s been said that hard work beats talent when talent doesn't work hard. It’s true. My promise to you is that if you can give me 100 percent for the next 90 days, you will not regret signing up to take my challenge. You will live a better life if you can adapt and implement the action steps I will share with you during the next three months. Am I perfect? Far from it. But my commitment is to bring you the very best of what I know works and it’s the main reason I’m living and learning a better life now than I ever imagined as a young boy.